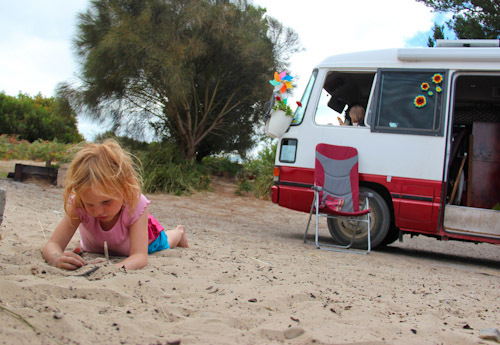 The grass may not be greener, but the sand is definitely cleaner at our new camp-site. I moved the bus earlier today to be closer to the water and in a place where the sand is not mixed with the soot from countless bushfires. We’re still in Narawntapu National Park and just on the water’s edge. 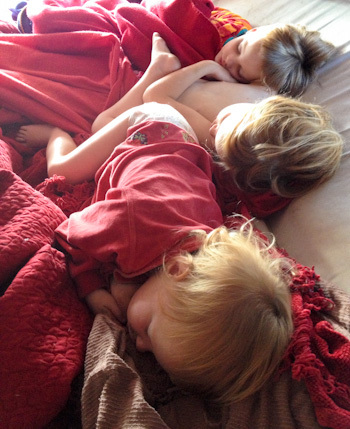 In the morning, I disentangle myself from mishmash of small children in the top bed. Aisha is also still asleep in the bed — just well-placed to avoid her sisters' flailing limbs. 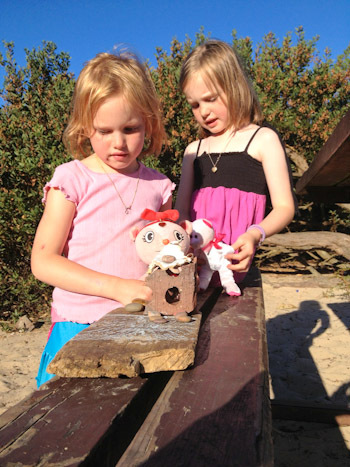 The girls start playing in the sand here, using found objects to create little mandalas, castles and fairy homes. It’s easy for the girls to play non-stop all day. I love to watch their little games, for in their interactions they mimic the social structures they know and the relationships that have been modelled. Now that Calista and Delaney have paired up, I’m more relaxed about seeing Aisha and Brioni in an exclusive imaginary world. Even the simplest items become props in their games, and with their ever-changing environment, the girls don't lack for inspiration. Late this afternoon, Brioni and Delaney decided to go for a swim. 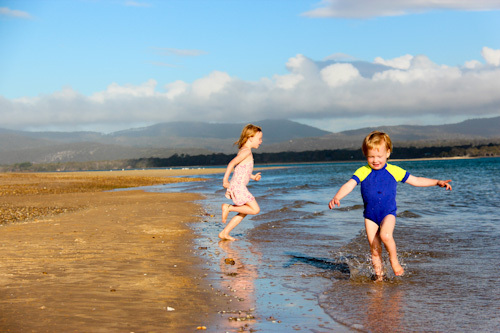 The bay water is extremely shallow for a long way out and almost waveless — perfect for Delaney — but too cold for me! Tonight the girls and I enjoyed a terrific game together where I dressed up and “judged” their designs in the sand. The girls were so chuffed with my costume that it makes me wonder if I don’t usually participate so eagerly in their games. All I did was put a colander on my head, wrap some clothes around it and sport a pair of googles, but it was enough to illicit gales of laughter from the three girls who were playing. With strange headgear, eyewear and a dodgy British accent, I become someone else entirely and the girls love it! Maybe I need to play some more. It’s good fun too. I like this spot so much. I’d love to stay much longer but we’re running out of food, and that means we need to head back to town. I always hope to come back to great spots, but there’s always more to discover, and that keeps us driving. But I’ll remember this spot in Tasmania as one of the best. Thanks for the video! I loved watching girls run for water such and idyllic setting!! 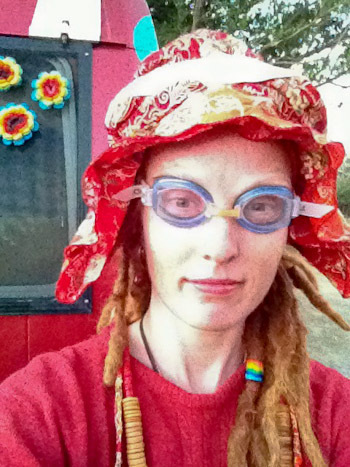 I LOVE that shot of you with your goggles. I discovered your blog this morning by accident, and have spent an inordinate number of hours (about 4) so far reading your life story. Thank god for the alternative and different. You have such a positive outlook on the world which seems to have such a negative outlook on you and your choices. I love how genuine you are. thankyou, keep writing, and I’ll keep reading and being inspired. Thanks for your question. Our children have the freedom to address us by either our names or “Mummy” and “Daddy”. I explained our philosophy in this post: http://www.sparklingadventures.com/index.php?id=1354. Dell still calls me “Mummy” a lot, though she has addressed me by my first name on a number of occasions and is doing so more frequently.